Peanut is definitely a bouncy baby boy! This was taken with my iPad 4, so it is a little poor quality. My mom bought this for SweetPea at my first baby shower, but she never took to it as a baby. But Peanut is getting a TON of use out of it! With all that hopping and jumping, I need a diaper that works. I have been a huge fan of Pampers for a while now. They are one of the few my daughter could wear on her sensitive hiney, and they hold up to all of my son's blow outs and leaks more than other brands. Pampers wants to see your baby's dance moves! Pampers is asking parents to show off their baby’s morning dance routine by uploading videos to Instagram and Facebook using hashtag #BabyGotMoves. Uploaded videos have the chance to appear in a shareable compilation video created by Pampers at the close of the initiative. Make sure to follow Pampers on Twitter & Facebook to keep up with fun! I received this prize pack and one VERY lucky Nanny to Mommy reader will get the chance to win one of their own! Retail value $100! Just follow the prompts on the Rafflecopter below. Open to US only, must be 18+ to enter. Winner is chosen by Random.org. ALL winning entries are verified. Giveaway ends 9/17 at midnight. Once notified, winner will have 24 hours to respond or another winner will be chosen. Thanks for dropping by and GOOD LUCK! my littlest is learning to walk!!!! He is almost crawling. He does a lot of rolling and scooting right now. My sweet 9 month old baby girl likes to move and groove to Disney songs and basically any music. She's crawling up a storm and standing up on everything in sight. She'll be walking soon I bet! Thanks for the opportunity-- what a fun prize pack. I watch little ones at church and they love dancing. 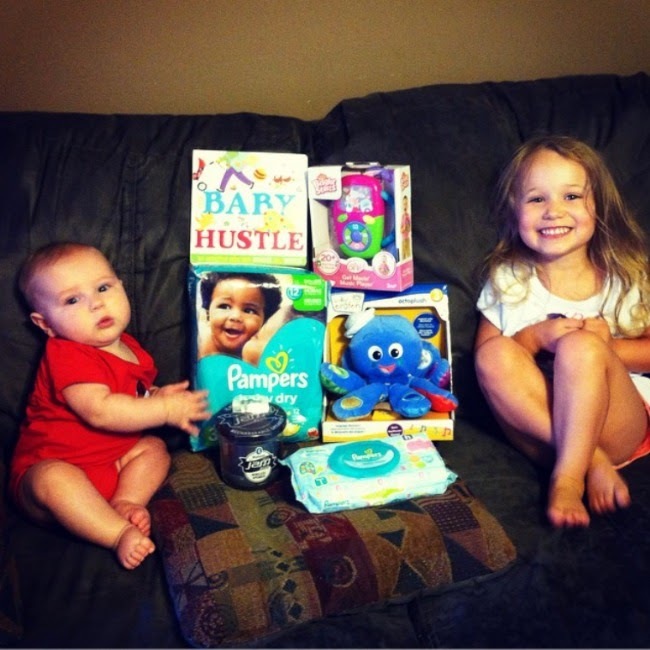 Love pampers! All other diapers made baby get a rash! I just discovered if I put on big band swing music my daughter will dance - bob and weave is her style so far, although every once in a while one hand goes up, which is adorable. My granddaughter loves to dance to the music channels on TV...it's tooooo cute! My daughter usually just spins in circles to dance! Our little one is walking and bounces up and down to any music! she loves that gangham style song! lol shes so silly! my kiddos love to dance, esp to let it go and tent theme song! Little one bobs her booty up and down, shes got better moves than me I'm sure. My little ones love to turn the kids music chanels on and dance. My little ones to "dance". Although at this point, dancing just consists of bouncing up and down. My grandson is 8 months and can crawl well and pull himself up to standing, so will be walking very soon, thanks!! My little one rolls all over the place, moving and shaking his little legs doing a happy baby dance! My little one just turned 7 months old! She is crawling, walking with her push toys and she dances with her sister! my son loves to dance!! my two lil ones love to dance to the shake shake song on the Disney junior commercial. they go around in circles and all, so cute. My Little One Loves To Play And Dance! Our granddaughter likes to move to the music as we sing! My little one liked to sing and dance. My son is learning to cruise. That is how he moves and grooves! My kiddo loves rock music! My daughter love to spin around in circles and clap to music! Around here we love to crank up the music channel on the TV to the Party Favorites station and rock out. My kids love to have a dance party. my 4 month old son loves to kick his legs and is in the process of trying to roll over to his tummy.